On the fifth Sunday of each month we join with the other churches in the Lordsbridge Team Ministry to worship together. Here are the details for this month’s united service. 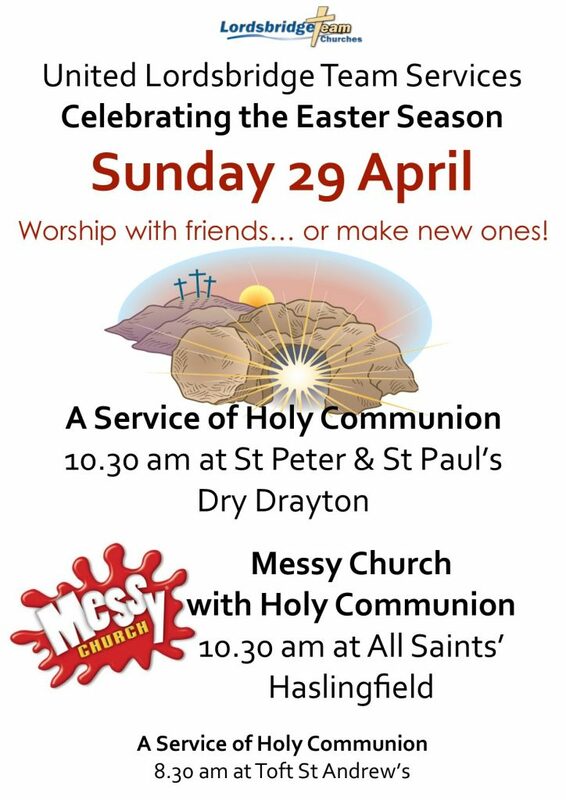 On Sunday 29th April there is a Holy Communion service at 10.30am this month at St Peter & St Paul’s Dry Drayton. An alternative child-friendly service is the ‘Messy Church’ with Holy Communion also at 10.30am at All Saints’ Haslingfield. For the early risers, there is also an 8.30am Holy Communion at St Andrew’s Toft. All three services will celebrate the Easter season.